CESA focuses on 'Reshaping our Future Together' - Doing what is Right! Pather in his opening remarks said, “President Ramaphosa’s renewed focus on the basic education sector specifically around maths and science and the development of skills will ready us for the 4th Industrial Revolution”. Over and above this the President’s call for further investment into Africa and latest statistics showing increased interest in South Africa as an investment destination are all positive indicators for the start of 2019. 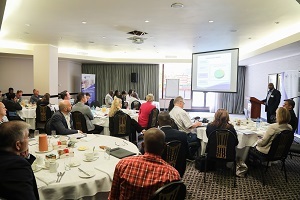 There is a strong focus within CESA on working with and supporting Government, with increased collaboration with National Treasury on Procurement, the Auditor General’s office on compliance support, together with partnering agreements with Client Bodies like SANRAL, Transnet and COGTA allowing CESA to contribute positively in terms of support that includes capacity building, skills development, compliance and good governance. He says that the 17 UN Sustainable Development Goals (SDGs) provide us all with the perfect platform to deliver purpose and engagement and a way for us to build trust between the public and private sectors. Pather said that during 2018 CESA was involved in detailed engagements to address the current challenges and the way forward with all of these organisations including entering into dialogue with the Parliamentary Appropriations Committee. CESA also met with the Minister of Education. The organisation met with ECSA, SABTACO, SAICE and BBCBE in a bid for broad industry collaboration. These initiatives include working towards capacitating infrastructure teams appropriately, in all client organisations, ensuring that the appropriate technical skills are used in decision making related to infrastructure development by ensuring the relevant skills and competence are utilized. Pather states that there needs to be a strong focus on providing ‘value for money’ infrastructure. More focus needs to be placed on calculating the best possible infrastructure solution based on the total life cycle costing of the project and not on procuring the lowest cost design fees which make up only approximately 3% of the lifecycle cost of a project. Pather states, “Sound planning and good feasibility studies incorporating innovative technology for the development of infrastructure is needed to drive economic prosperity and growth”. Pather states we need active citizens taking account of our own future without waiting for someone else to do this. Implementation is key and CESA will be focused on assisting Clients to focus on delivery and action as opposed to just talking about it. He believes that ‘Working together’ - industry bodies can assist in driving specific mandates, clients can focus on driving project management and delivery teams need to focus on driving execution. Pather believes that there is a strong need for collaboration of industry bodies and key stakeholders for collective benefit as opposed to diluting effort – working with universities, learned institutions and research bodies to drive our education system but also training people sufficiently in both the private and public sectors to undertake the roles they are meant to play in delivering infrastructure. This can be undertaken through the CESA School of Consulting Engineering, the Thuthuka Bursary Programme, SAICE Road to Registration, as well as the CESA Business of Consulting Engineering (BCE) Development Programme etc. Pather strongly believes that collectively the industry needs to address the issue of the importance of engineers as well as focus on creating the right narrative to be able to attract young engineers into the Built Environment and infrastructure space to make sure that sustainability and relevance is ensured. In addition, Pather notes that the latest industry statistics relating to transformation shows an alarming picture notwithstanding all of the efforts being made in promoting and encouraging greater numbers of black engineers to enter the industry, the numbers tell a different story. He adds that the results are not going to change overnight. This is largely due to the decreasing workload in engineering, driven directly through economic decline. “The use of technology to speed up delivery and to properly satisfy demand will soon become a reality for all of us. We need to start future-proofing our teams and reinventing our service offering to embed technology going forward. All of these advances will be targeting faster design, more cost-effective solutions and more consistent delivery of infrastructure and construction projects from both a time and cost perspective, says Pather. CESA represents close to 560-member firms employing over 21 000 people. Through its focus on quality and the credibility it has created with various client organisations it represents the hallmark of competence, integrity, and quality in the consulting engineering industry.